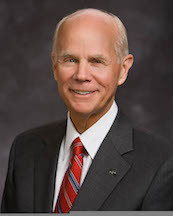 Lance B. Wickman is an emeritus General Authority Seventy of The Church of Jesus Christ of Latter-day Saints. He was sustained a member of the Second Quorum of the Seventy on April 2, 1994, and was transferred to the First Quorum of the Seventy on April 1, 2000. He was designated emeritus status on October 2, 2010. Wickman was born on November 11, 1940, in Seattle, Washington, and raised in East Orange, New Jersey, and Glendale, California. During the Vietnam war, he was commissioned as a Second Lieutenant in the infantry of the US Army. He was a platoon leader and was awarded the Bronze Star, the Purple Heart, the Valorous Unit Award, and the Combat Infantryman Badge. On a second tour of duty he was a military advisor to the Army of the Republic of Vietnam. Prior to the war, Wickman had earned his bachelor’s degree in political science from the University of California, Berkeley. After Vietnam, he graduated from Stanford Law School and practiced law in Los Angeles and San Diego. Wickman married Patricia Farr soon after returning from his full-time mission to the Central British Mission. They are the parents of five children. He has also served as a priesthood group leader in southeast Asia, a bishop, stake president, and regional representative. He has been active in Scouting and was awarded the Silver Beaver and the Silver Buffalo for his service. This page was last edited on 1 June 2017, at 14:09.